*G8 (Group of Eight) refers to the forum of governmental leaders of eight large, industrialized nations: the United States, Japan, Germany, France, the United Kingdom, Italy, Canada, and Russia. 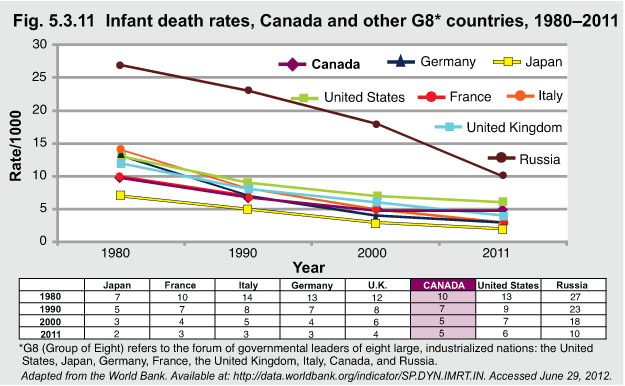 In 1980, Canada tied for the second lowest (10/1,000) infant death rate compared to other G8 countries. In Canada, infant mortality decreased to 5 per 1,000 live births in 2011 from 10 per 1,000 live births in 1980. 1Conference Board of Canada. “Infant Mortality.” Available at: http://www.conferenceboard.ca/hcp/details/health/infant-mortality-rate.aspx – accessed on June 29, 2012.